Cook the cabbage in boiling water for 3 minutes or until just tender. Drain thoroughly. Melt the butter in a frying pan and add the onion, garlic and caraway seeds. Cook for 3-4 minutes until the onion has softened. Place the cabbage with the mashed potato in a large bowl. Using a slotted spoon, remove the onion mixture from the frying pan and add to the bowl, reserving any of the butter in the bottom of the pan. Add the parsley and flour to the bowl and mix everything together well. Season to taste. Using floured hands, divide the mixture into 4 and shape into rounds. Reheat the frying pan over a medium heat then add the potato cakes. Cook for 4-5 minutes until the underside is golden brown and crisp, then turn over and cook for a further 4-5 minutes, adding a little oil to the butter if needed. Keep warm while you poach the eggs. Half-fill a frying pan with water and bring to the boil. Reduce to a simmer and break in the eggs, one at a time. Increase the heat to bring back to a simmer and cook the eggs for 3 minutes. Remove using a slotted spoon; drain. Place 2 potato cakes on each plate. 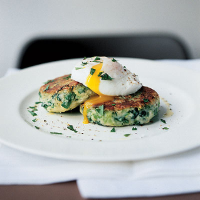 Top with a poached egg, season and sprinkle with parsley. Serve immediately. Make the potato cakes the day before, cover and chill in the fridge until ready to use.